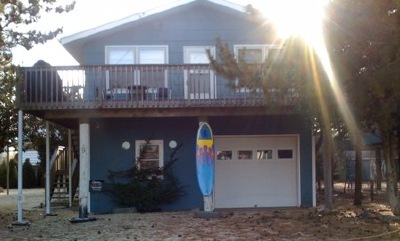 We are located ocean side on East 7th street at the northern tip of LBI. We have a family friendly home with 4 bedrooms, 1 1/2 baths, High speed internet WiFi, outside shower with hot & cold water, play room, 2 decks, screened in porch, and much more. 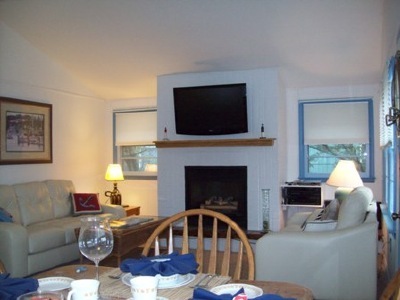 Our Barnegat Light rental is the perfect vacation get away offered diretly by owner. The house is on a quiet street that is kid friendly close to parks, tennis, basketball, skate boarding, etc. Come stay with us at our newly remodeled beachcomber home just steps from the beach across from the historic Coast Guard Building on East 7th Street! We are in the very private section of the northern tip of LBI, only 1 1/2 blocks from the northernmost tip of Long Beach Island, a short walk to the lighthouse and the Viking's Village. Dine at the waterfront or at one of the many local restaurants. Ample off-street parking. Peek at our two spacious decks through portholes. Enjoy fine new leather furniture in the main living area with a 42 inch LCD flat panel LG TV., as well as a 65" HD Ca Wi-Fi high speed internet access available. Our spacious dining room sits a family of eight in comfort. Or, grill outside, dine on the picnic table, enjoy the ocean breezes on the decks or in the screened in porch. Living room with fireplace (gas log), 42” LG HD TV, surround sound, DVD, stereo, leather furniture, etc. Playroom has 65" HD cable TV. Other amenities include 2 other color TVs, state-of-the-art stereo, fully equipped modern kitchen, gas log fireplace, stairs leads down to separate children's quarters, play room, washer/dryer. Beach toys, beach chairs, beach umbrellas, beach tags included. Children and surfers welcome, sorry--no pets.